On September 30, Christina Sterbenz had an article on Business Insider, 7 Reasons Why I Refuse To Stop Eating Meat. I’d like to quickly respond to a couple of her reasons. While it is true iron from meat is more absorbable than from plants, this would only be a problem for people who are prone to iron-deficiency anemia. I have not come across a vegetarian man diagnosed with iron deficiency anemia that I can remember and none have been reported in the studies on vegetarians and iron deficiency. Some vegetarian women are iron deficient but this can be corrected by changing some habits, like eating foods higher in iron combined with vitamin C, and avoiding coffee and tea at meals. But if you are absorbing enough iron (as most vegetarians are), the iron from plants works just as well as the iron from meat. In fact, while vegetarians normally do not have iron deficiency, they do have lower levels of iron which may reduce their risk of diabetes. And the good type of iron that Sterbenz touts, heme iron, is associated with colon cancer while the iron from plants is not (more information on iron and chronic disease). Spinach is an excellent source of iron with 3 mg per 1/2 cup cooked. A full cup of cooked spinach (not hard at all to eat) meets almost the entire RDA for men (8 mg) and 1/3 the RDA for menstruating women (18 mg). Sterbenz then says, “Almost all multi-vitamins contain B12, as well. But recent research suggests vitamins might be useless,” and links to the article, Vitamin pills ‘are useless’, which describes a study that found supplementing with beta-carotene, vitamin E, and vitamin C did not prevent cancer, heart disease or stroke. This is completely different than showing that vitamin B12 supplements are useless. On the contrary, it is well-documented, conclusive, and without controversy in the mainstream medical and nutrition community, that vitamin B12 supplements work at preventing and correcting vitamin B12 deficiency. Finally, something I agree with. But I don’t believe we’re “meant” to eat anything. We evolved eating certain foods (including lots of insects) and now that we are more ethically evolved some of us are moving society away from killing animals for food. That said, since Sterbenz says she cares about animals, I hope she will experiment with at least replacing more meat with oysters! Since she can stomach them, and apparently loves to eat them, she could help prevent animal suffering by eating oysters instead of pigs, cows, and chickens. Even better, eat some spinach for iron, and try a nice juicy Tofurky sausage for protein and fat. I know meat-eaters don’t think it’s the same thing, but it’s pretty close and without the entrails. Ginny Messina also responded to this article in her post 7 Reasons to Eat Meat? Here Is Why They Are All Wrong. This entry was posted on Tuesday, October 1st, 2013 at 6:36 pm and is filed under Animals & Ethics, Iron. You can follow any responses to this entry through the RSS 2.0 feed. You can skip to the end and leave a response. Pinging is currently not allowed. Thanks for this post Jack. These assertions and myths continue despite the information now widely available. I’d like for people to check whether it’s the raw beef or raw chicken that they desire?… or the finished dish, after it’s been marinated/seasoned/grilled? Not too many people crave a raw chicken wing. It’s all about how we season and prepare our foods – and we can do the same for plant foods, just as well or better. Jack, thanks for this post, much appreciated. On the topic of iron absorption, would you mind commenting on to what extent consuming calcium inhibits iron absorption? I’ve read that iron you hope to absorb should probably not be consumed in the same meal as any significant amount of calcium. Thanks to the late great Bertrand Russell for posting that link. I first came across this argument in a book called Dominion Over Wildlife? The author challenged me to a debate on Amazon, but when I wrote my Amazon review, he ran for the mountains; never heard back from him. 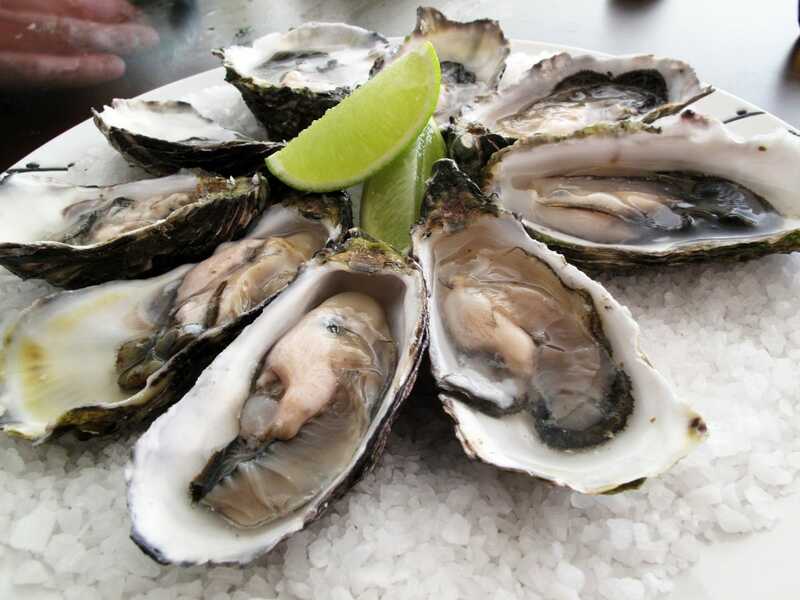 Have you ever tried oysters? I have. One. Its smell and sliminess caused me such a gag reflex that I had to bury my face into my then-SO’s shirt in order to swallow that fishy snot (we were at a party). Never again, no matter how non-sentient they might be. I strongly suspect that the real reason that Sterbenz continues to eat meat has little to do with nutrition. She is just one of those people selfish enough to cause others, lots of others, to suffer and die for her own pleasure. I agree, nutrition was a side issue for Sterbenz and her real reasons are as she laid out in her article: the enjoys meat and her happiness is more important than the suffering of animals. However, I almost titled the post “The lady doth protest too much” because I get the sense that she actually does feel guilty about eating animals and so I was trying to urge her along in the direction of reconsidering. I would love to see references the part where it is asserted that human digestive tracks demonstrate we are omnivores. The only articles I have read pretty handily show them as matching up with herbavores except for a characteristic or two which are shared by both omnivores and herbavores. I would love to read about it if you can share. Great rebuttal! Thanks for publishing this so that everyone can participate in the discussion. We’re still not sure if Oysters feel pain. They have a nervous system but no brain. Disgust is a poor argument against eating oysters. These sessile organisms are rich in nutrients and are just as incapable of sensation or suffering as plants. Moreover, I personally consider eating an oyster to be far more ethically justifiable than eating a scone or pastry made with SEA palm oil. It’s time to change the definition of veganism to explicitly allow the consumption of organisms that do not sense pain. Is veganism about ending exploitation/reducing suffering or is it about arbitrary and dogmatic food rules? So, in the technical sense of what an omnivore is, due to the bugs we would be classified as an omnivore. But functionally we really are not since most of us no longer eat bugs. But, I like the focus on our expanded ethical awareness taking a more important roll than the dietary history. Thanks again for the info. Thanks for this rebuttal. It’s too unfortunate that the same arguments keep coming up everytime but I’m glad there are a few experts out here on which we can rely. I have a question about spinach though. As far as I’ve understood the iron in spinach is pretty much useless. Am I mistaken and would a proper source of vitamin C ensure that a significant part of the iron is still absorbed? Thank you in advance. Thank you for your reply. I guess I never checked whether the many, many websites claiming that oxalate binds to iron were truthful. I indeed found some recent studies showing that oxalic acid doesn’t impair non-heme iron absorption. However, if the research is really conclusive then the spinach page on Wikipedia needs a thorough update. However, this is the only one I can find. Do you base your information on more studies? If not, then doesn’t that mean that the evidence is still rather sparse and more research may be necessary? Almost every website and even our national (Dutch) health association website writes that oxalic acid blocks non heme iron absorbtion (although no one states respectable sources). The reason I care is because I aim to write a Dutch piece on iron for vegans, but do not want to make fase claims. I hope I don’t bother you too much. You are not bothering me. I do not know of any other studies. I haven’t read the full paper of the one you cite, but I suppose it’s possible that the calcium in the spinach protected the iron from the oxalates and that a low-calcium/high oxalate food could prevent iron absorption. Until there is research showing this, I would not say that oxalates prevent iron absorption. Yes its true the author may have her facts mixed up, but I don’t completely fault her, well maybe I do since you need to do true journalism, but its not wrong to be skeptical of what people perceive to be fads and ignoring things. All vegans should verse themselves in proper nutrition, there have been criminal prosecutions, where the prosecutor overreached but the reason they did or tried to get away with over reaching is because many folks including prosecutors may view certain vegans as “not trusting traditional medicine”. So an infant may die and not be malnourished (though there have been cases), but the person being a vegan may gave a person some ammo.